The Markets continued with a strong upsurge on Tuesday and the Indices went on to end the day with record high closings. The benchmark NIFTY50 surged 117.50 points or 1.07% to end at yet another record high. Speaking purely on technical ground, the Markets ending near the high point of the day has prepared a ground for itself for yet another positive opening on the following day. Going into trade on Wednesday, we expect a modestly positive opening once again. However, with the current levels, we need to approach the Markets with heightened levels of caution. Volatility is expected to creep in as we enter the penultimate day of the expiry of the current derivative series. 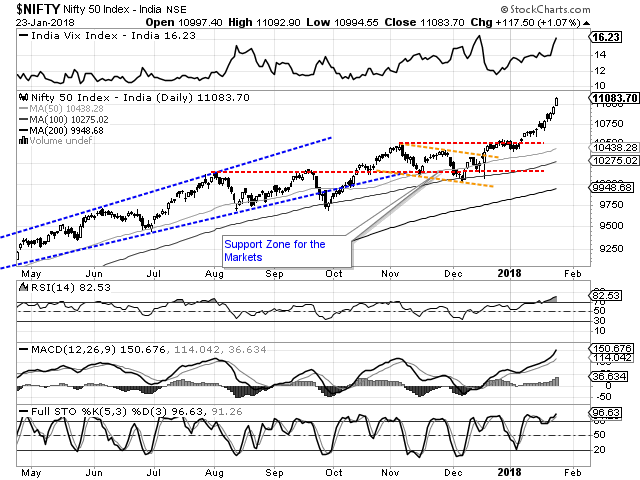 The levels of 11100 and 11175 will play out as immediate resistance levels for the Markets. Supports have now shifted higher but still exit little lower at 10975 and 10910 zones. The Relative Strength Index – RSI on the Daily Chart is 82.5336. 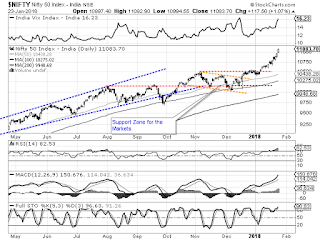 It has marked a fresh 14-period high which is bullish but it now trades heavily in overbought area. The Daily MACD stays bullish while it trades above its signal line. The pattern analysis show the NIFTY firmly in a breakout mode and it is seen continuing with it for some more time. However, the overbought nature of the Markets warrants some caution and we might also see some volatility creeping into the Markets. All in all, it is beyond discussion that the Markets are in firmly established up trend. However, that being said, the Markets are showing some signs of tiredness and some slowing down of momentum. The Market breadth remained a concern on Tuesday as the broader markets under-performed the frontline indices. Though the momentum may continue, it may slow down a bit and may show some reduction in relative strength. We recommend remaining highly cautious at higher levels. There are heightened chances that the Markets may take some breather at higher levels from here and may choose to consolidate. With volatility likely to remain ingrained in the Markets, we advice highly vigil approach with each higher level in the Markets.